One of this Grandma’s mantras is that children remember most the traditions and rituals from their childhood. That is why getting together for holidays and special family events is so important. That is why creating an annual photo album for the grandchild is so important. 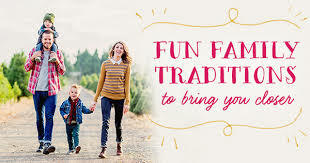 Memorializing family traditions and rituals helps keep them alive for the grandchild and also then perpetuates the memories through the generations. Grandma can easily find inexpensive photo albums after holiday sales and Shutterfly.com has many specials for ordering photographs. Remember that in this digital age, there may be hundreds of photographs of the grandchildren, but they never see them on the computer. The grandchildren cherish their photo albums made by grandma. Our grandchildren keep them all near their bed and look at them often. It seems that this Grandma is not the only one thinking about creating memories with grandchildren. On the Today Show, November 9, 2015, there was a segment on what one remembers about his or her childhood. Savannah Guthrie said she remembered a time her father spontaneously decided to fly a kite with her. There was an on line post on Today.com about the segment, “One Dad’s Reflection: The 5 Things Your Kids Will Remember About You,” by Eun Kyung Kim, which was geared to parents creating memories of childhood. Some are poignant and some are just sad in a list the author got from the faith-based website Patheos. Here they are and how grandma may be able to assist in turning the sad and poignant things into wonderful memories in 2016. How can grandma help? There are times grandma may not want to intervene in the family of the grandchild, but when anger is repetitive and severe, and goes to emotional abuse or physical abuse of the child or the other parent, then everyone has a duty to intervene. Hugs and kisses to a grandchild may not be enough. This Grandma believes we can only speak to the parent of the grandchild who is our child, and that should be done. There is counseling and other programs for each member of the family. If it is the in-law parent with the anger issue, the parent who is our child must take the lead in stepping up to make the child feel secure. If they do not act, it may grandma mean speaking the family’s religious leader and getting advice from a professional, such as a psychologist, on how to best serve the grandchild and make the grandchild feel secure and safe. It may mean contacting authorities. There are now studies that show emotional and physical abuse is generational. If we grandmas do not intervene, then our grandchildren are likely to abuse or be abused when they are adults. This affects our great grandchildren, as well as our grandchildren. This is important and when safety is involved, grandma has a duty to intervene in grandchild’s intact family. How can grandma help? We grandmas are more spontaneous because we have the time and we are no longer embarrassed at being silly. We can encourage the parents by example. No one has to encourage us to give our grandchildren undivided attention. We can encourage by pointing out to the parents of the grandchildren the wonderful little things our grandchildren do that make them so special. The parents are busy working and living life and sometimes miss the small joys of daily life. How can grandma help? This Grandma says life interferes with the intimacy of the relationship of the parents of our grandchildren. We grandmas can give respite and relief and promote the loving relationship by taking the grandchildren at least four times a year for at least 24 hours, so long as the parents of the grandchildren agree to go away without electronics and enjoy each other’s company. What a win-win! We get undivided spoiling time with the grandchildren. How can grandma help? This Grandma never had grandparents. I hear very often that I have missed the special love and relationship that only a grandparent has for a grandchild. That fullness of love, encouragement, and positive reinforcement that comes from a grandparent can make up for what may be lacking in the intact family. It is not work to bring that fullness of love, encouragement, and positive reinforcement to our precious grandchildren. It is joy. The work is encouraging the parents of the grandchildren to also do this. How can grandma help? Be proactive. Surprise the family with a pizza night and a new board game. Repeat this once a month or periodically. This Grandma says we grandmas can be the glue to hold the extended family together to make sure the family stays close when we are no longer around. Plan multigenerational vacations and get togethers. We can create family memories and traditions that last beyond our time. But, let us concentrate on one day at a time to create wonderful lasting memories for our precious grandchildren in the New Year 2016. Check www.michaels.com for their after holiday sale on photograph albums or www.retailmenot.com for coupon codes.